Articles: An Empirical Analysis of the Causes of Consumer Bankruptcy: Will Bankruptcy Reform Really Change Anything? Edward D. Dembling joined Methfessel and Werbel in November 2006. He works on the first party/property team under the supervision of Stephen R. Katzman. At Rutgers Law School Ed was a Staff Editor for the Rutgers Business Law Journal. In addition, he worked with the Rutgers Special Education Clinic, representing special needs children in the pursuit of a free and appropriate public education. Ed also served as a legal intern for the Hon. 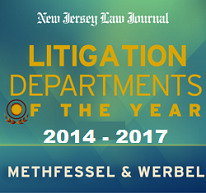 E.. Benn Micheletti, J.S.C., in Monmouth County Superior Court. In college, Ed received the Lotte Kaliski Scholarship Award for Gifted Students and enjoyed membership in the Golden Key and Phi Alpha Theta History Honor Societies.